You only have a limited amount of time and money, so will have to choose where you allocate this when it comes to marketing. We will bring together all the marketing elements I’ve covered recently into a plan of action. By the end you will have a timetable and budget breakdown to allocate your marketing spend effectively, and be able to track the results. As with business plans, sometimes people can become overwhelmed by a marketing plan, but it is just a list of what you are planning to do and when. As with the easy business plan, a simple plan that you use is infinitely better than a complex one you don’t. You need to decide how much time and money you’re going to spend on each of the marketing options, and then plan for this – diary notes are ideal, as there are usually times of year when there are relevant marketing opportunities depending on your business. 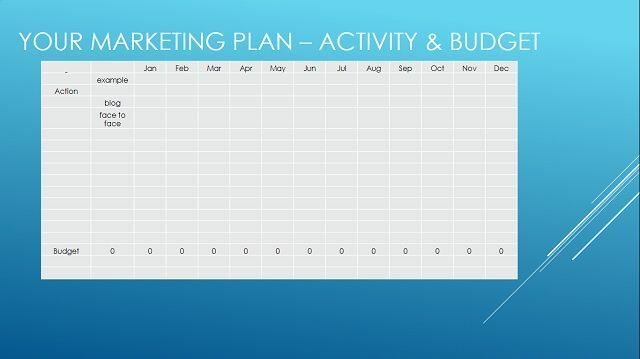 In the top half of the marketing plan you can see a calendar where you plan your activity – perhaps to tie in with seasonal events in your industry. It also ensures that you are covering the main sources. 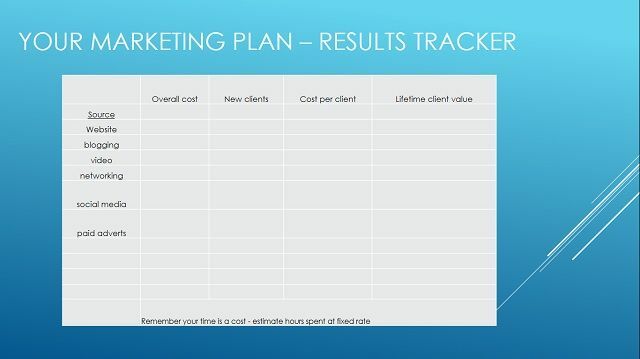 The budget you have allocated will then be split amongst the marketing sources, but you should be mindful of the shark spiral I discussed – it will take time to get results, and throwing large amounts of money may not bring in enough results to cover the expenses and your costs. You will most likely want to try several methods initially, and then refine that down to what works best as you generate data. Once you have some results, tracking them on a spreadsheet is ideal, so remember to always ask new clients how they found you. You would list the source of the client; then how much you spend on advertising for that source. Remember we covered that your own time isn’t free – so estimate how many hours you have spent and use a fixed hourly rate to get an estimate. If you know roughly how much a client is worth to you then you can also compare this to the marketing spend. A client’s ‘worth’ in marketing terms is easy to calculate: you work out the average cost that you charge per client and then multiply it by the amount of repeat business. For example, if you charged £250 and were likely to have recurring business 4 times with that client their lifetime worth would be £1,000. You can then compare this to how much it has cost to acquire the client, to see if the marketing method is worthwhile. Sometimes you might find that the marketing cost might even exceed the lifetime value, so although the marketing could be said to work in getting you the client – if it actually cost you more money than you would ever make from the client then it should be stopped. It’s only by recording this information that you will know what really works and what doesn’t. Over time the effectiveness of different channels will change, so it is not a fixed document – rather it will change as the markets change. That’s why you have to keep monitoring the data. As with a business plan, it is important to have a written plan of action for marketing that you use and regularly revisit to help you grow your business successfully.